Cover letters are a mandatory part that should be sent with a resume and job application every time one wants to apply for a new job. It is applicable more for the experienced candidates rather than freshers. 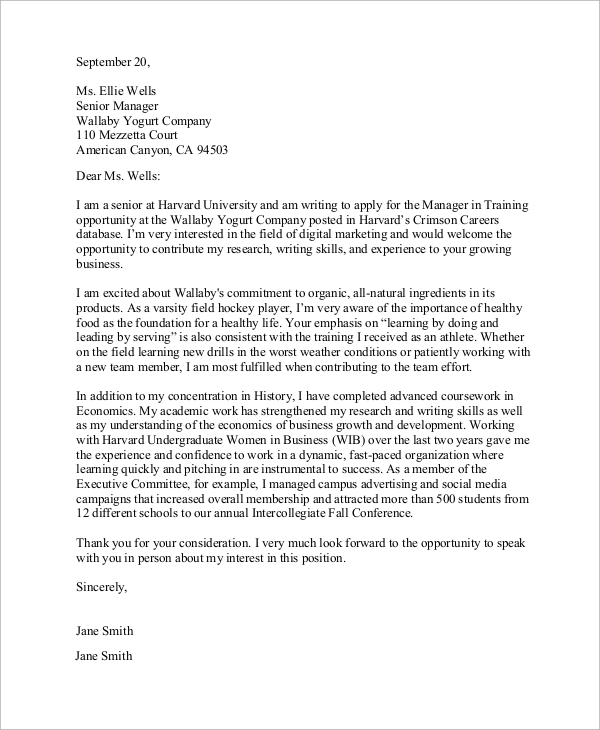 Writing a Sample Cover Letter requires skills and they must sound super impressive and at the same time should cover all the points the candidate have and the things that an interviewer is likely to look for. The following examples of a cover letter provide all the instructions with illustrations. This is a generic cover letter example for any job. It contains all the guidelines to follow to prepare an amazing cover letter that will increase the chance of selection. It contains multiple examples and illustrations to explain the steps to be followed. 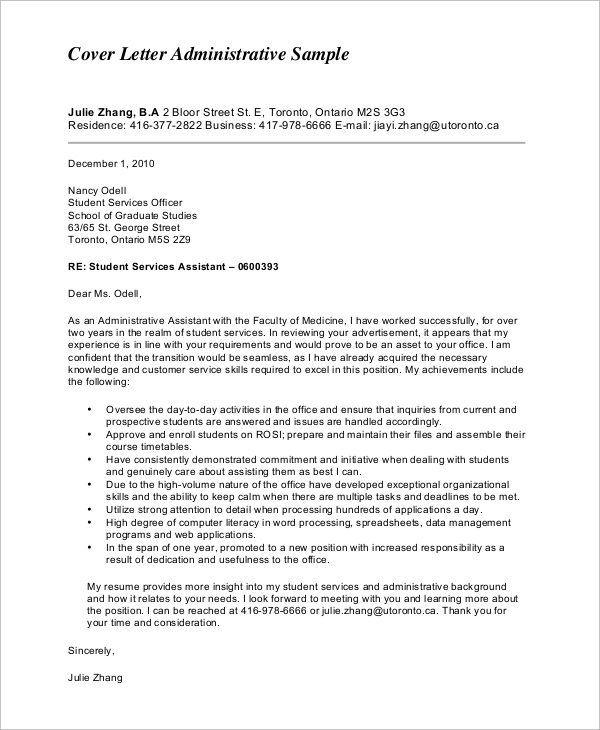 Administrative Assistant Cover Letter example is designed for applying for the administrative assistant post. It is well presented, and it highlights the professional, and personal traits in bullet points. It has the action words and phrases to follow and the tone that should be used. 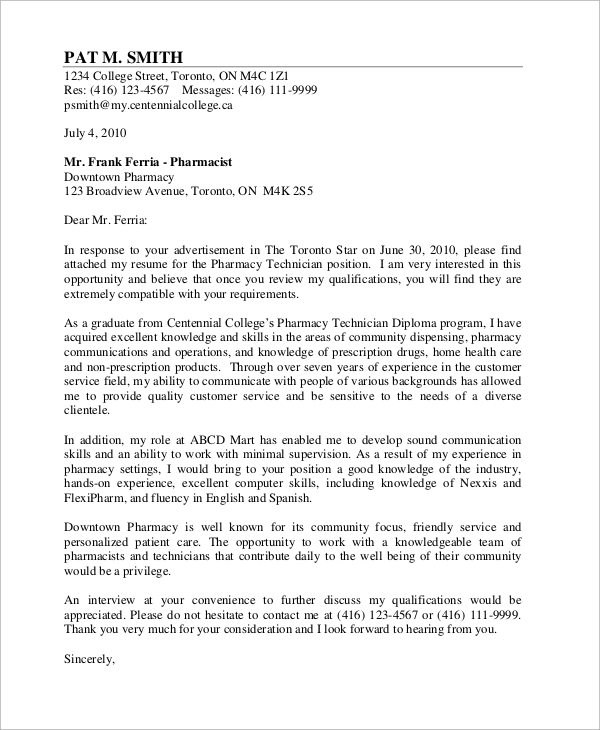 This is a cover letter for a pharmacy job. 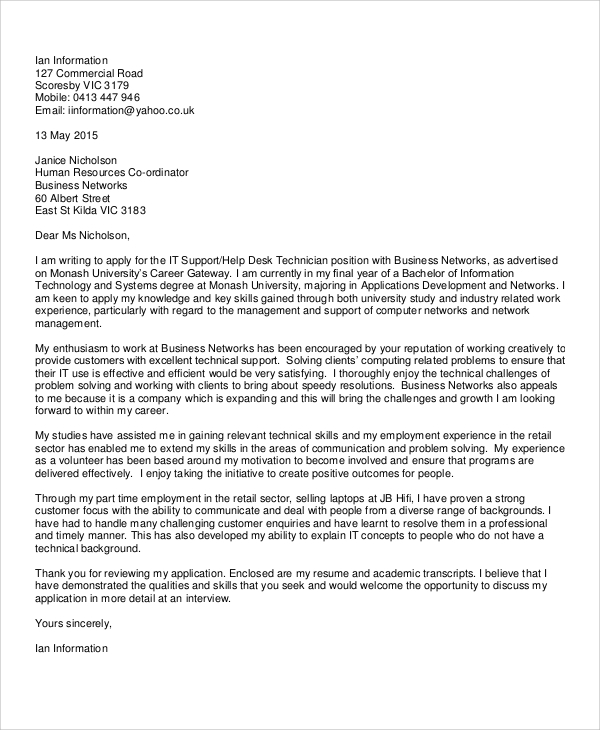 This is a perfect cover letter example that will make the interviewer impress at once. 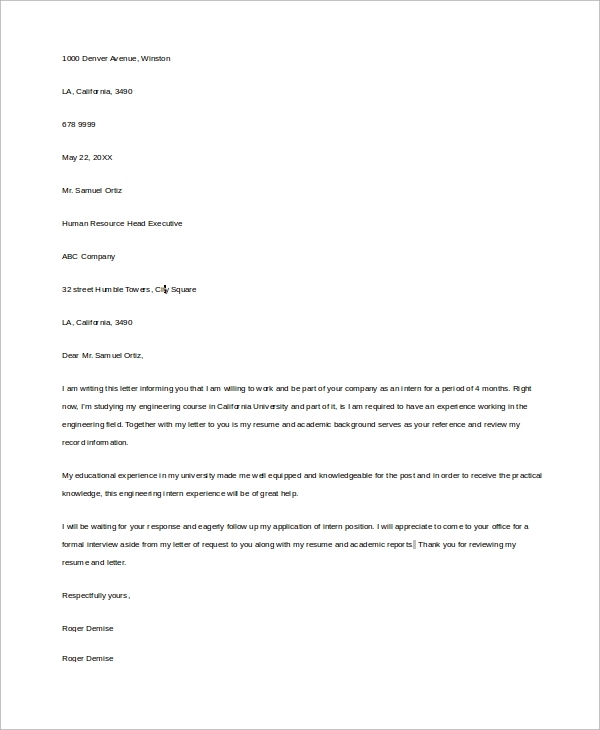 It has five paragraphs, and it covers all the points that an interviewer looks for in the cover letter to judge the suitability of a candidate. The Cover Letter Samples are the ones that an interviewer checks out first even before going through the resume because a cover letter indicates the writing and creative skills of a person, lists the personal traits more than professional ones which at times most of the candidates lack and fail in future. A cover letter needs to be written correctly according to the format provided and the points to cover in different paragraphs. There are different types of cover letters listed above to cater to all the freshers and experienced professionals, and they can find it easy to write a cover letter with the guidelines provided. 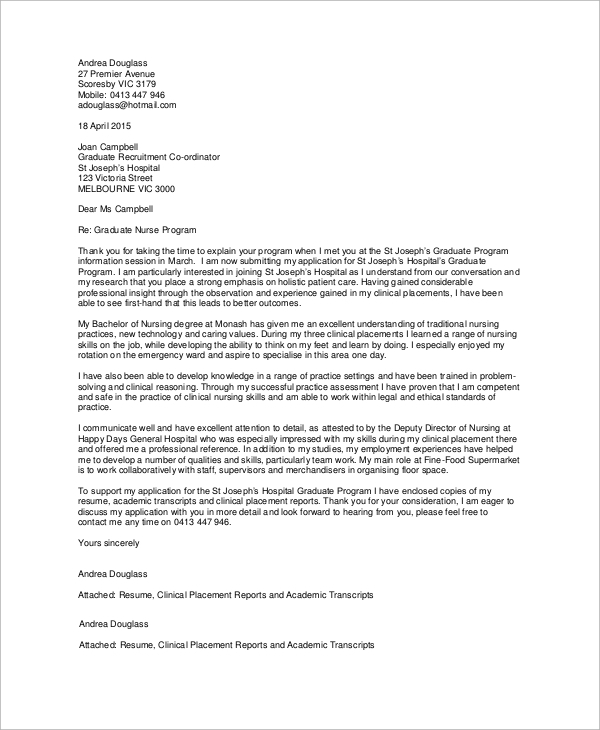 Nursing Cover Letter is used to apply for nursing jobs. It has five paragraphs, and each paragraph has specific objectivity. One justifies why the candidate is suitable, other highlights the professional and personal traits that are immensely useful and the other shows the interest and passion for the job. 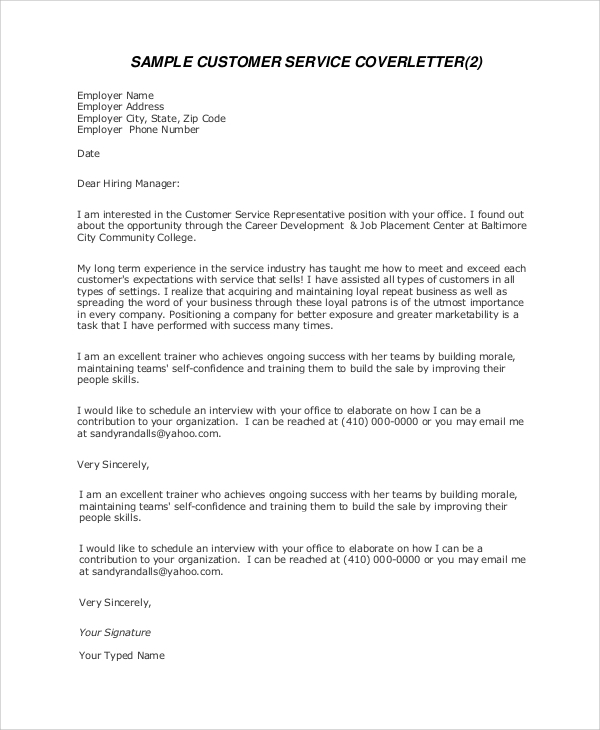 This is a cover letter example for customer service jobs. It lists the highlighting qualities of the candidate, the professional experiences, personal traits, passion, interest and career objectivity all of which makes the candidate perfect for the job. The targeted audiences for the Examples of a Cover Letter are the freshers and the experienced professionals who are willing to apply in different companies for a good job. They are also applicable for the students who want to get an internship program. 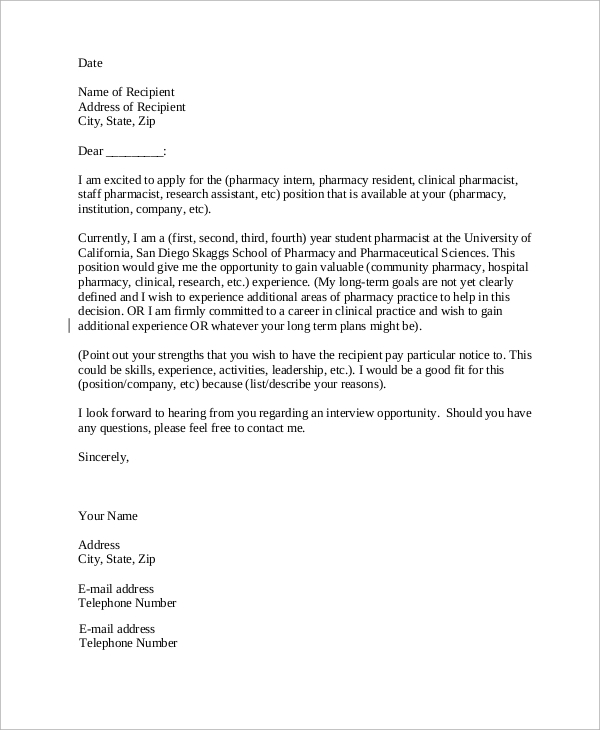 There are different types of cover letters, and hence, the people associated with pharmacy, nursing, customer service, administration jobs will find them more useful. 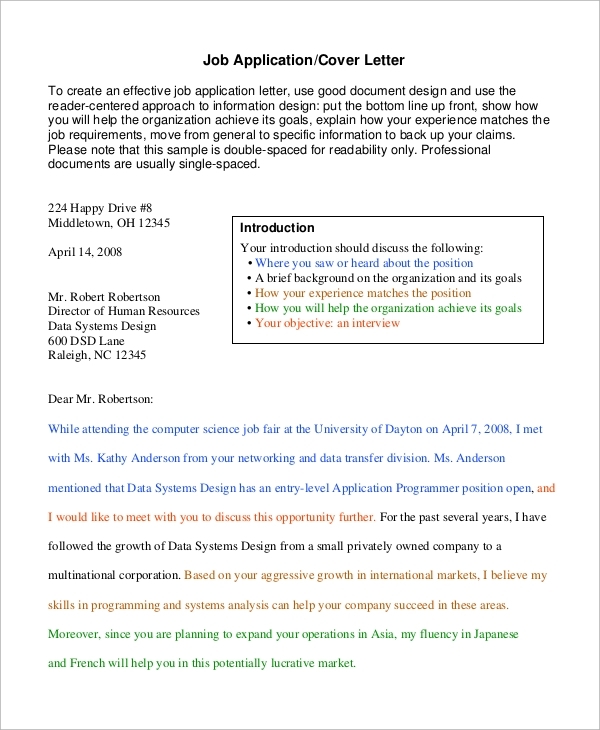 The above-listed examples of Resume Cover Letter contain multiple samples and illustrations for the instructions and the steps that are mentioned in them. All one needs to do is to follow them rigorously, copy the tone and flow, use the action words and phrases and write a super impressive cover letter for different types of jobs effortlessly to edge past his or her competitors.